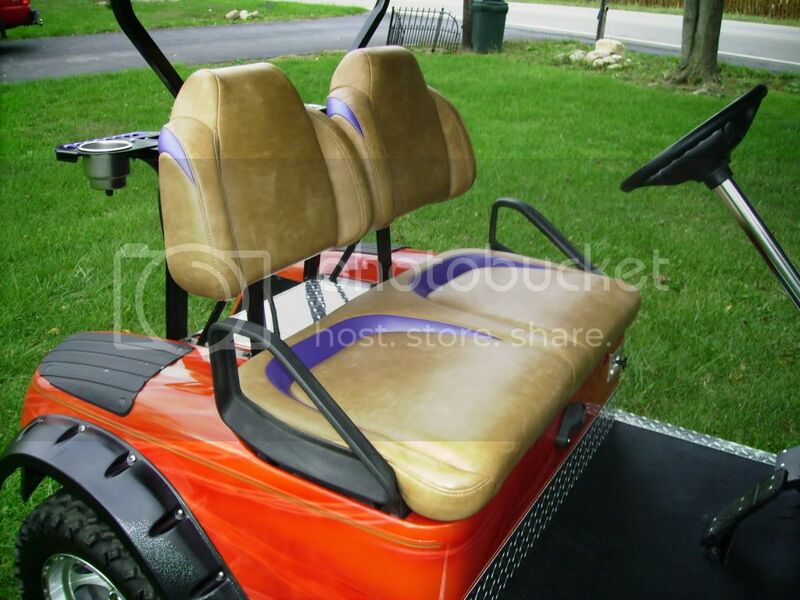 Here is a close-up photo of a seat that we designed for my custom E-Z-GO golf cart. What do you think? We can make this in many vinyl color combinations possible. In the boating industry we designed seats that held you in place so you did not get tossed side to side, and had extra padding for the rough rides. With golf carts running faster than ever, the same principal applies to them. A plain (bench) style seating is no longer good enough. xt could you pm a price? those seats look awsome. I can send you the seat back frame and a seat bottom, which will fit the g-14 - g-22. I will send you a email to discuss. We plan to develope a Retail price, and a D-Net price, based on the number of seat quantities ordered from dealers. Like I stated this is all still work in progress right now, but I want thank everyone for the favorable comments. Craig / XT, let me know what you guys come up with. I'm looking for new covers for my G16. XT, I would also sincerely be interested in any design ideas you might have.